my mom passed away in 2006 and barbara last year, it would be a tribute and legacy left to them to have their works documented and recorded. i believe it is of utmost importance (& respect) to include & acknowledge appropriation of British Columbia First Nations’ culture and include this as my mother was a Dutch immigrant from Rotterdam and Barbara, from Germany. Both women had a many gifts: an eye for copying, sophisticated skills at the potter’s wheel (my mother painting in Delft; the famous Delft bleu), & a steady hand with a fine brush. Joyce, thank you for your valuable contribution to the research on Lambert Potteries. I would love to add images of your collection to this website. Please send them to my email contact or upload them thru this site. I do not personally own any Lambert Potteries pieces – the photos here were submitted by other collectors, and we will hope they can verify if the pieces have your mom’s signature ‘t’ on them. 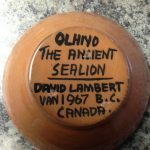 Please check out the page here on Lambert Potteries where I will be adding the info about your mom and her friend once I receive the photos you have so kindly offered to send. The link is in the blog post above. Thanks again for the information. It is only through comments such as yours that we get such a rich body of research on our own Canadian potters and manufacturers. i will send you the MOA’s collection, but you can easily find it under David Lambert, again the artists who he hired are not acknowledged as having painted the pieces. i hope to find other adult children who may have some interest in gathering the pieces. i am honoured to have her works at the MOA, that seems the place where they belong, but the Appropriation needs to be acknowledged. 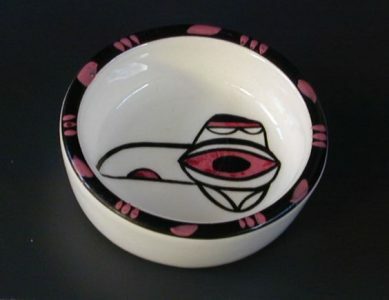 will send you the ceramics curator’s name, the Vancouver museum also has a piece, but i have not contacted them as yet. if the stories are not told, as the First Nations have taught me, they will be lost and so will the dignity of our elders, my mother especially. Artists of his day (1940s-60s) did not recognize ‘cultural appropriation’. We will certainly try to make up for it with acknowledgement and appreciation of the beauty of West Coast First Nations stories, art & design. 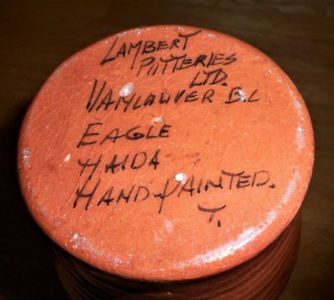 Joyce, I have a collection of Lambert Pottery including plates signed by “T”. 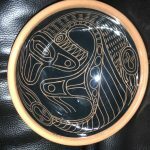 One plate with the title “Sea Wolf” is quite unusual with an asymmetric shape and what I would call an abstract of a First Nation design. Would you have any insight into how this design originated? If you like I can provide a photo. I was interested to read that your mother was from Delft as I visited last year and saw artists painting the Delft pottery. I would be interested to see other designs that she did. my mother trude vannieuwland vandegriend was actually born in Rotterdam in 1927 and came to Canada in 1952. she rode her bicycle to Delft for the job at the pottery. she was an avid sailor as well. if you like we can perhaps speak on the old fashioned telephone and i am also on facebook to privately send you my number. I am happy to tell you what i know. her works are at the Museum of Anthropology also which i just recently discovered and the UBC curator, carol was interested in finding out more. all i can tell you is that the designs were indeed mostly copied and appropriated (stolen) from the First Nations and were perhaps not even authentically Haida. with respect to indigenous artists and Haida culture it is of my interest to give back to those who were taken advantage of for profit as sadly the fight goes on for reclamation and education of the degree of damage due to cultural disrespect of the artists who first created the images.